The adult choir is an integral part of most Sunday worship services. In addition to hymns the choir presents a weekly anthem and leads the congregation in choral responses. In addition, the choir has special presentations at Christmas and at Easter. The choir meets weekly on Wednesdays at 7:00 PM at the church except for July and August. There is a choir retreat the last week in September and the choir members plan a variety of social events throughout the year. This a great group of folks so come sing with us or come and hear us, whichever is your thing to do. 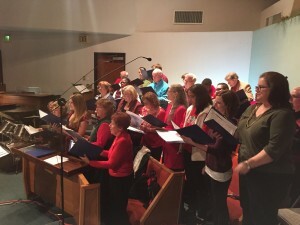 Church of the Foothills incorporates a wide range of music and worship styles – from traditional to contemporary and beyond. Tina Glander Peterson is so excited to be joining the Church of the Foothills music ministry! Tina earned her Bachelor of Music Education degree from University of Wisconsin-Whitewater and her Master of Music in Music Education and Choral Conducting from the University of Wisconsin-Milwaukee. She currently serves Director of Choirs at Irvine High School where she directs five choirs and AP music theory and is also proud to be the Assistant Director of the Southern California Children’s Choir for Concert Choir and Ensemble. From 2007-2010, she was the Director of Choirs at Oak Middle School in Los Alamitos, CA., and taught choral music for ten years in the public schools of Wisconsin. Church music has always been a large part of Tina’s life. Growing up in Wisconsin singing and playing in both vocal and bell choirs, as well as directing both vocal and bell choirs, church music is embedded in every fiber of her being! In the most recent past, Tina served at Interim Director of Music at Irvine United Congregational Church where she enjoyed leading the Chancel Choir. Tina and her husband Chris live in Tustin with their two adorable six-pound Japanese Chin dogs, Suki and Hannya.